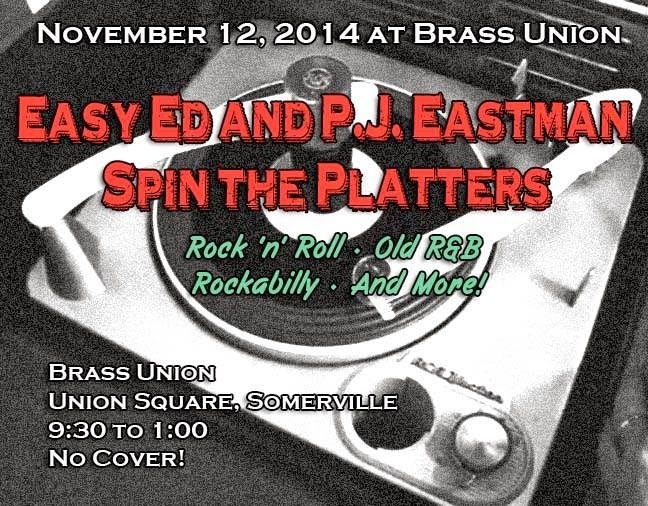 November 12 2014 at Brass Union: Easy Ed and P.J. Eastman Spin the Platters! Join WMFO DJs Easy Ed and P.J. Eastman for a special night of vinyl spinning at a new club, Brass Union in Union Square, Somerville (formerly Precinct). They'll have their best records lined up for your listening and dancing pleasure. Vintage rock 'n' roll and R&B, blues, soul, exotic instros, movers, and shakers. This is a very cool venue with excellent food and drinks, as well as games and a dance floor. See you there! Brass Union is located at 70 Union Square in Somerville, MA 02143. See the Facebook event link for more info.